Vancouver, British Columbia, February 21, 2019 -- Garibaldi Resources (TSX.V: GGI) (the “Company”) or “Garibaldi”) is pleased to announce that the Company has drilled into widespread near-surface nickel-copper sulphide mineralization including massive sulphides in what is now referred to as the “Northeast” zone at Nickel Mountain, further building on the Golden Triangle’s first nickel-copper-rich sulphide system that also includes cobalt, platinum, palladium, gold and silver. The shallow new Northeast zone, located above the “Upper Discovery” and “Lower Discovery” zones, has now been intersected in three drill holes and is open to the east and north. Drill hole EL-18-33 cut three separate intervals highlighted by 4.8 meters of massive sulphides featuring 7.7% nickel and 2.95% copper within a broader 49-meter intersection starting at a downhole depth of just 37.9 meters and grading 1.34% nickel and 0.89% copper (see attached map). 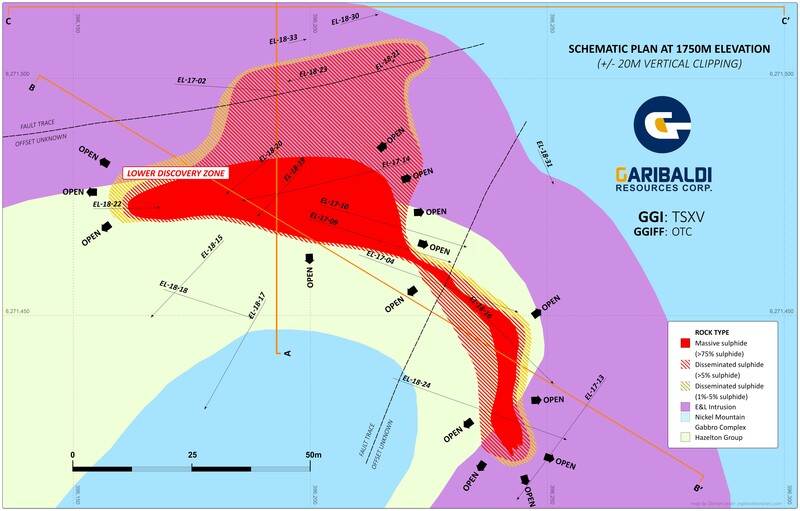 A detailed review of geological and geophysical information pertaining to the Upper Discovery and Lower Discovery zones has revealed a robust flat-lying massive sulphide system with continuity that remains open for expansion in multiple directions as shown in new maps attached to this news release. Assay results for the final 13 holes of the 2018 program (EL-18-34 through EL-18-46) are pending and will be released when received, reviewed and interpreted. Dr. Peter Lightfoot, Technical Adviser for Garibaldi, commented: “EL-18-33 and EL-18-30 confirm the exceptionally high grades of the massive sulphide mineralization in the new Northeast zone, first detected in EL-18-23 (see Oct. 21, 2018, news release), at shallow levels on the northern flank of the E&L Intrusion. Combined 1% nickel-copper is a minimum threshold for comparative analysis. Intervals are core lengths (true widths unknown at this time). Following detailed petrological and geochemical data from drill core, coupled with assays reported previously, geological sections and plans have been constructed to illustrate the distribution of massive and disseminated sulphides in relation to the E&L Intrusion, Hazelton Group sedimentary rocks, and equigranular gabbros of the Nickel Mountain Gabbroic Complex (see attached maps). The E&L Intrusion typically consists of taxitic to orbicular textured gabbro and melagabbro with disseminated sulphides and locally grades into a texture of melagabbro orbicles separated by heavily disseminated sulphide. 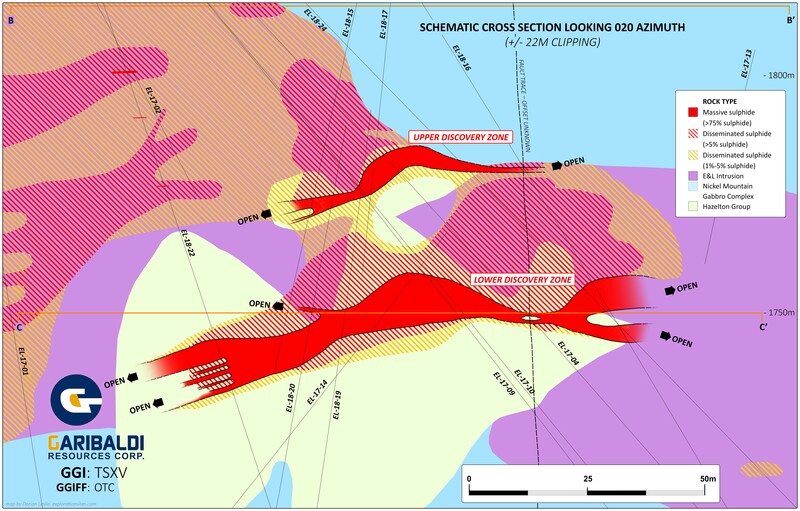 The immediately adjacent sub-horizontal sediment-hosted massive sulphide mineralization of the Lower Discovery zone is shown to extend laterally more than 120 meters and has not been closed off. The Upper Discovery zone comprises massive sulphides at the edge of the E&L Intrusion, and the north-south facing cross section illustrates that these sub-horizontal sheets appear to be stacked at the edge of the Intrusion. The Upper Discovery zone is open to the west, east and south. The sheet-like massive sulphides of the Lower and Upper Discovery zones and the overlying Northeast zone are indicative of a strong sub-horizontal control on massive sulphide mineralization at the edge of the E&L chamber. This will help guide aggressive drilling that targets expansion of existing zones and the discovery of new massive sulphide zones in 2019. 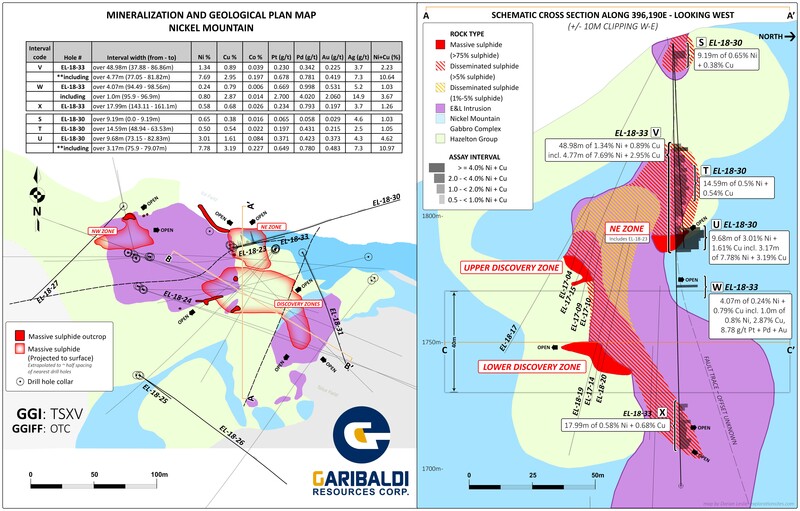 A further review of data related to Garibaldi’s first drill hole at Nickel Mountain in August 2017 suggests that EL-17-01 was even more significant than initially believed. EL-17-01 provides geochemical and geological evidence that there is a separate and deeper chamber approximately 160 meters below the Lower Discovery zone. Garibaldi’s 2018 drill program was designed with two primary goals. The highest priority was to focus on expanding the known mineralized footprint around both the historic Northwest zone and the 2017 Discovery zone, with a particular emphasis on detection of high value massive sulphides utilizing borehole electromagnetic geophysics. Drill hole EL-18-31 targeted the east side of the northeast fault zone. Encouragingly, nearly the entire hole consisted of Nickel Mountain gabbro, intersecting a thick 275-meter sequence of gabbro to locally taxitic E&L gabbro, including well-developed orbicular features from 373 to 394 meters. This confirms the area is highly prospective. Drill hole EL-18-29 was a 700-meter step-out to the southeast, targeting the center of the Anomaly F VTEM conductor. The hole intersected a thick sequence of volcanics with some sedimentary rocks. The sparse pyritic mineralization encountered would not explain the conductivity. Drill holes EL-18-28 and EL-18-32 were both large step-outs, 1.4 km south of the Northwest zone testing portions of a magnetic anomaly. Both holes outlined mostly Hazelton volcanic rocks with no significant mineralization but provided important stratigraphic knowledge. The highlight was 39 meters of melagabbro in EL-18-28 from 679.8 to 718 meters with trace to 1% sulphides (pyrite-chalcopyrite). This intersection is 775 meters south of taxitic melagabbro in EL-18-26 and provides an attractive target area for follow-up exploration. Drill hole EL-18-27 tested for sulphides following the SW-NE trending fault behind the Northwest zone massive sulphides. This hole intersected Nickel Mountain gabbro but not significant mineralization. Its importance was to help map out the extent and shape of the Intrusive complex. El-18-25 and EL-18-26 tested the area below the Sumitomo adit. Hole 25 was abandoned at 95 meters due to the change in dip downhole exceeding thresholds. Hole 26 encountered a sequence of disseminated sulphides in taxitic gabbro and melagabbro of the E&L Intrusion. This part of the intrusion warrants further exploration. Steve Regoci, Garibaldi President and CEO, commented: “The massive sulphide grades at Nickel Mountain continue to be in the very top tier globally as evidenced by the new Northeast zone near-surface discovery. A much bigger overall picture is also emerging with the four known zones open in multiple directions and showing continuity of mineralization. “As we evaluate the balance of the data that will continue to flow in from the 2018 program over the next few weeks, we are simultaneously planning a vigorous fully-funded 2019 drilling campaign designed to take the Nickel Mountain Project to an entirely new level given our greatly enhanced understanding of this dynamic and structurally intriguing system. We look forward to meeting investors at PDAC in Toronto in early March where Garibaldi has been selected to participate in the prestigious and popular Core Shack portion of the world’s premier mineral exploration and mining event,” Regoci concluded. Garibaldi Resources has applied a rigorous quality assurance/quality control program at the E&L Nickel Mountain Project using best industry practice. All core was logged by a professional geoscientist and selected intervals were sampled. NQ2 drill core was sawn in half and each sample half was placed in a marked sample bag with a corresponding sample tag then sealed. The remaining half core is retained in core boxes that are stored at a secure facility in Smithers, British Columbia. Chain of custody of samples was recorded and maintained for all samples from the drill to the laboratory. All diamond drilling sample batches included 5% QA/QC samples consisting of certified blanks, standards and field duplicates. Two certified ore assay laboratory standards and one blank standard were used in the process and were supplied by CDN Resource Laboratories Ltd., an independent laboratory located in Langley, British Columbia. Samples were submitted to SGS Canada Inc. in Vancouver, British Columbia, an ISO 9001: 2008 certified lab, for base metal, sulphur and precious metal analysis using Inductivity Coupled Plasma (ICP), Fire Assay (FA) and Leco methods. Samples were prepared by crushing the entire sample to 75% passing 2 mm, riffle splitting 250 grams and pulverizing the split to better than 85% passing 75 microns. Gold, Platinum and Palladium were analyzed using a 30-gram fire assay and ICP-AES. Total sulphur was analyzed using a Leco method. Nickel, copper, cobalt, silver and other elements were analyzed by sodium peroxide fusion and ICP-MS. The performance on the blind standards, blanks and duplicates achieved high levels of accuracy and reproducibility and has been verified by Jeremy Hanson, a Qualified Person as defined by NI-43-101. Mr. Jeremy Hanson, P.Geo., VP Exploration Canada for the Company, and a Qualified Person as defined by NI-43-101, has supervised the preparation of, reviewed and approved of, the disclosure of information in this news release. Mr. Hanson has verified the data, including drilling, sampling, test and recovery data by supervising all of such procedures. There are no known factors that could materially affect the reliability of data collected and verified under his supervision. No quality assurance/quality control issues have been identified to date.